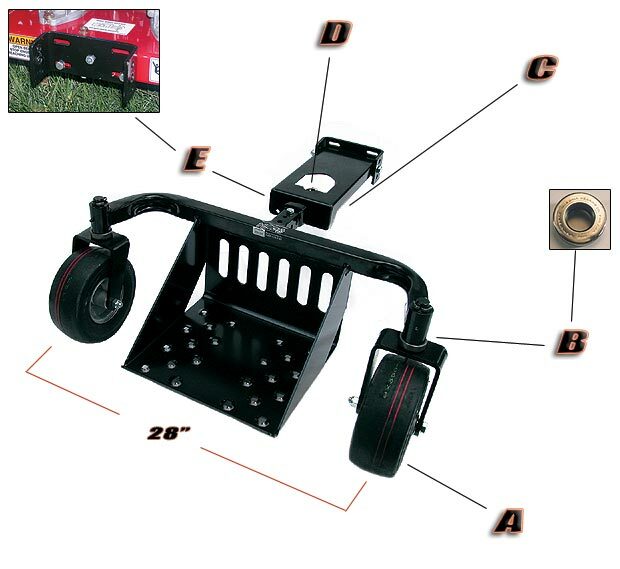 Trimmer Trap Bull Rider caster wheel Sulky with Universal Connecting Arm for Most Brand Mowers. Commercial mowers aren't constructed like homeowner's mowers, so why should sulkies be made that way? In the rugged world of commercial mowing there's no substitute for good ol' heavy duty steel. Our superior designs and state of the art manufacturing using extra heavy duty components assures the longest life possible from your investment. Will this work on a belt drive (15hp)? It is a universal sulky, will mount on the machine but you have to consider the weight to make sure the unit will pull it. Yes, if you have somewhere to bolt it to the back then it will work. Will this sulky work on a Exmark Metro? Yes it should work. As long as your Exmark Metro has a flat surface fram on the rear below the transmission, the bracket should mount. If the bracket mounts, then it will work. From what I can tell, it will work.